The following is the 2014 calendar of 5% cashback bonus promotions for some of the credit cards and debit cards that are currently offering a 5% promotion. These cards include Citi Dividend, Discover Card, Chase Freedom, and Target REDcard. For more information about the card and promotion, click through the links for the specifics. Citi® Dividend Platinum Select® Visa® Card Jul-Sept Earn 5% cash back every quarter in must-have categories. Right now, on eligible purchases within the Hilton portfolio, car rental agencies, movie theaters and theme parks from July 1, 2014, to September 30, 2014. Chase Freedom Jul-Sept Earn 5% cash on purchases at Gas stations and Kohl’s®, upon enrollment. Target REDcard Ongoing All Target store and online purchases except gift cards or prescriptions. 5% discount is stackable with other Target coupon and promo codes. This page does not include all available credit card offers or cards from all issuers; and it was not reviewed by, endorsed, or approved by the issuers mentioned on this page. I’m an avid fan of the Target debit card. Use it every time I go. Paring this 5% back with a coupon or two definitely makes shopping there cheaper than anything else (even Walmart). @Sam – Our family use the Target card every time we go to Target. Probably the best deal if you’re going to shop there. 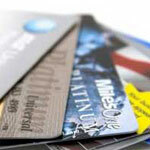 I’ve used several of the above credit cards and been very happy with them overall. I like using the Fideltiy rewards American Express. I always get 2% back on all of my purchases. It has worked great for me. I have an MBNA card, and they give the cash back via cheque whenever it reaches the $50.00 milestone. They send them in discreet looking envelopes that I almost always think is junk mail before opening. They also imitate the look of those silly cash back cheques they send hoping that people will use them. I wonder how often these are thrown out or recycled because of these tactics? I am bad with reward cards. I tend to spend more on my cards in an effort to earn more rewards forgetting about the interest rates that are getting tacked on if I don’t pay off the balance in full! Does anyone know anything about the new Chase Liquid card? Is it a credit card or a prepaid debit card? Can you get great cash back deals on it like these cards? I just learned recently that my aunt is a loyal customer of Target because it is nearer her place and she uses Target REDcard, which she loves because of the cashback she receives from her purchases. If the supermarket let you buy $500 denomination MasterCard, Visa, or Amex gift cards with the 5% reward credit card for $5.95 fees you now have a credit card that pays you back ~4% good anywhere that a debit card is accepted. @PJ – Nice trick. Thank you for sharing. The rewards are very tempting. But we have learned our lesson. We have decided to stick with one card alone so that we can pay it off at the end of the month. I just received my credit card statement and it’s always fab when you see just how much you’ve built up in rewards, which I can now go and spend!!!!!! Love it. I get my rewards direct off my annual bill, rather than discounts on amazon or gas.